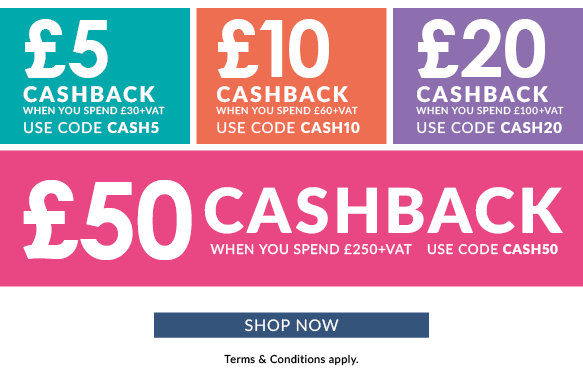 From Monday 5th to Sunday 11th June, we are rewarding our lovely customers with cashback discount codes when they shop with us! If your bill comes to £30 or more not including VAT then you will be given £5 discount on that transaction. If your bill comes to £60 or more not including VAT then you will be given £10 discount on that transaction. If your bill comes to £100 or more not including VAT then you will be given £20 discount on that transaction. If your bill comes to £250 or more not including VAT then you will be given £50 discount on that transaction. Only one discount to be given per transaction. Offer valid from 05/06/17 – 11/06/17. Online transactions may be subject to a delivery charge. This promotion is not available in M&S stores.